There was a gradual increase in the incidence of “Normal” outcome group in each of the successive groups of 200 cases, going from 83.5 % in Group I, eventually to 91 % in Group IV. However, this difference (i.e. 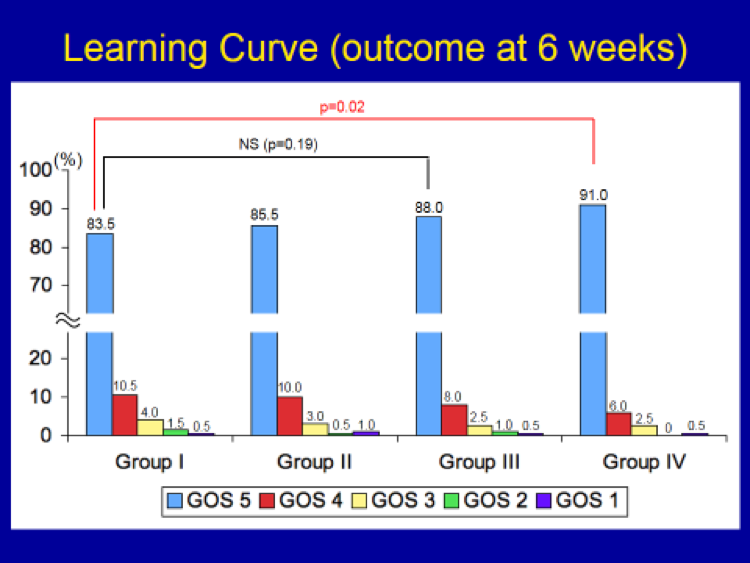 improvement) was not statistically significant until the last group (Group IV) of 200 cases. In other words, it takes a surgeon at least 600 cases of accumulated experience to make a statistically significant improvement in outcome in meningioma surgery. In short, surgeon’s experience is a critically important factor in determining outcome in meningioma surgery.